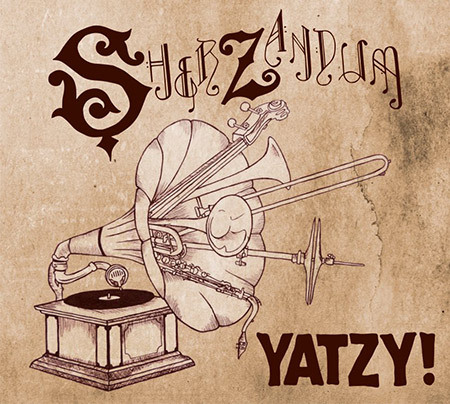 Sherzandum - Yatzy! Play now! Sherzandum deliver energetic and emotive dance parties, directly from the hearts of the 7 man band, that plays klezmer with eclectic trips to balkan and swinging jazz. Pumping swing rytms, precise breaks and brass riffs from the deep pits of the big-band culture in the name of world music is the mix, when Sherzandum start doing their magical thing! The bands performance and joy of playing have brought them to all corners of Denmark, which also has given them the price as DK's Folk Talent of the Year in '14 and a showcase at the world-renowned Tønder Festival. Sherzandum have recently reloaded the weapons with a new repertoir, along with their first record Yatzy! released in March 2017 and are ready to play all of the festivals in the summer of '17 aiming at creating the biggest party in town - anywhere they go.